Stainless Direct UK design, manufacture and install bespoke, made to measure stainless steel kitchens and have had an online store for some time. The site had become out of date and didn’t work on modern mobiles and tablets. 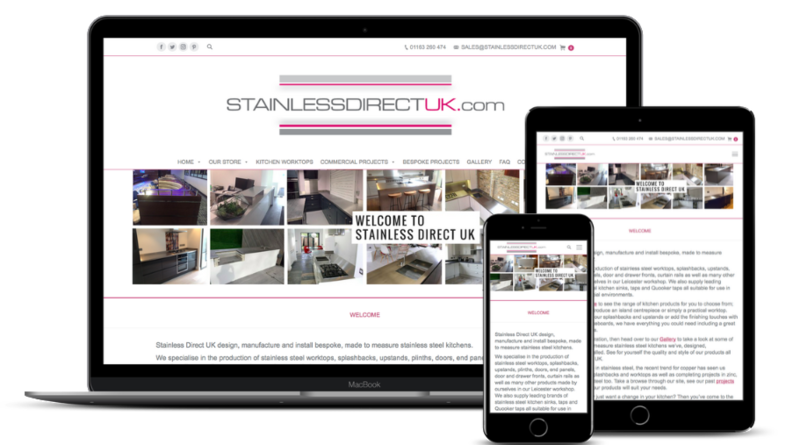 Stainless Direct UK realised they needed an update to stop losing visitors and to help their Google search ranking. We have just launched their brand new site – almost as shiny as their Stainless Steel worktops. We paid much attention to the past SEO to maintain their page one ranking on Google and Yahoo. We helped load over 250 products and optimise the images, coded bespoke pricing options by finish, dimensions and area. We added Stripe Card payment processing and Paypal to their secure checkout. Finally, we optimised the site and arranged a smooth upgrade. Within an hour of launch, orders started to arrive. We now manage the Google Adwords advertising allowing full spend vs income tracking, help with social media marketing and are now starting full email campaign marketing. Our subscription plans are all inclusive with no hidden extras, and we are always here to keep your site right up to date. We include any content writing, artwork, hosting on our cloud SSL secure server and ongoing optimisation for performance and search engine optimisation. If you would like to discuss your existing site or a new site just reply, visit contact us or call 0116 2160293.